"During a visit to Arlington National Cemetery in the Spring of 1984, Carmella LaSpada, Chairman of the Board of No Greater Love (NGL), asked Ray Costanzo, the cemetery superintendent, about an interesting-looking pine tree located some one-hundred yards from the Tomb of the Unknown Soldier. He informed her that it was a Korean White Pine, planted in 1965 by former Korean President Park Chung Hee in honor of the Americans who lost their lives while serving in the Korean War. When she asked where the memorial to these men was located, the superintendent told her that there was no national memorial for those veterans. In disbelief, Ms. LaSpada asked if the pine tree had been the site of any national remembrance ceremonies for the Americans who died in Korea. The superintendent told her th at, as far as he was aware, there had been no national ceremonies to remember these men. 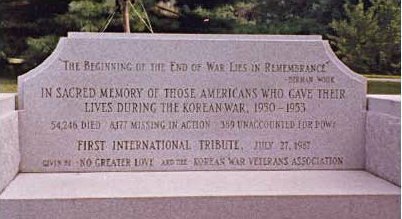 Ms. LaSpada returned to the No Greater Love office, checked with the Department of Defense, and learned that the cemetery superintendent was correct: there was no national memorial and had never been a national remembrance ceremony for the Americans who served in the Korean War. No Greater Love then began planning the First International Tribute to these men, including the dedication of a memorial meditation bench in their honor. NGL contacted the Korean War Veterans Association (KWVA), an organization composed of veterans from all branches of the U.S. Armed Services. Since 1985, KWVA members have held a ceremony at Arlington National Cemetery on July 27th in memory of their fallen comrades. KWVA enthusiastically supported No Greater Love’s idea of having an International Tribute on July 27, 1987. Today, No Greater Love is proud to join with the Korean War Veterans Association in dedicating a memorial meditation bench and giving an International Tribute to those who lost their lives while serving in the Korean War." during the Korean War, 1950-1953. 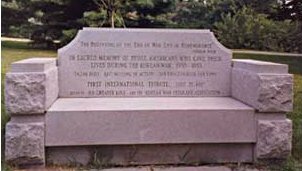 Dedicated on July 27, 1987 at the First International Tribute given by No Greater Love, Inc. Korean War Veterans Association"
The design for the bench was created by Korean-American architect Ik Pyo Hong. The granite block was donated by Ned Thomas of Columbia Gardens, Arlington, Virginia. Thomas was also responsible for the carving. Click on the image above left to view larger image of wording.